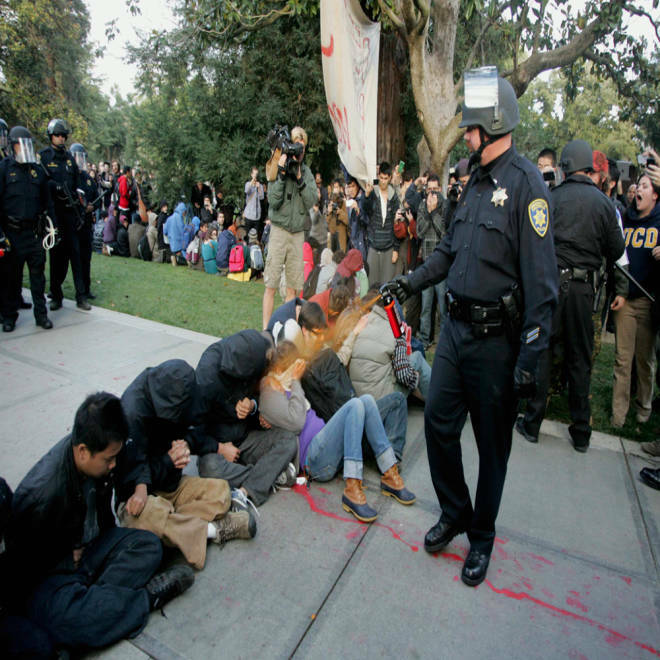 A UC-Davis police officer pepper-sprays students during their sit-in at an "Occupy UCD" demonstration in Davis, Calif., in this Nov. 18 file photo. Updated at 1:42 p.m. ET: The University of California has agreed to pay about $1 million to settle a lawsuit filed by UC-Davis students who were pepper-sprayed by campus police during an Occupy-style protest on campus last November. The settlement also calls for a personal written apology from UC-Davis Chancellor Linda Katehi to each person hit with the spray. UC and plaintiffs represented by the American Civil Liberties Union filed the preliminary settlement in federal court in Sacramento on Wednesday, The Associated Press reported. Under the agreement, which must be approved by a federal judge, the university will pay $30,000 to each of 21 students and former students named in the complaint and an additional $250,000 for their attorneys to split. The settlement also calls for the UC to set aside $100,000 to pay other individuals who can prove they were arrested or pepper-sprayed during the Nov. 18, 2011, incident. Videos and photos taken by witnesses of an officer methodically spraying orange pepper-spray in the faces of nonviolent protesters quickly went viral. Many of the demonstrators were sitting on a campus pathway with arms linked in a protest against tuition hikes and income inequality. Police in riot gear pepper-sprayed University of California Davis students, as the young protesters sat arms linked, making no moves. NBC's Kristen Dahlgren reports. The outcry led to more campus protests, and some called for Katehi to resign. A task force report released in April blamed the incident on poor communication and planning throughout the campus chain of command, from the chancellor to the pepper-spraying officers. Students at UC-Davis call for the school's chancellor, Linda Katehi, to resign. Nathan Brown, an assistant professor at UC Davis, tells msnbc's Thomas Roberts "the buck stops with the chancellor." Fatima Sbeih, one of the plaintiffs in the lawsuit, said in a statement the incident created a divide between students and campus police, The Los Angeles Times reported. “Since Nov. 18, students have been afraid of the police. The university still needs to work to rebuild students’ trust and this settlement is a step in the right direction,” said Sbeih, who recently graduated with a degree in international studies, according to the Times. The UC-Davis police officers who doused the protesters won’t face criminal charges. The Yolo County District Attorney’s office said in a statement last week that there was insufficient evidence to prove the use of force was illegal. John Pike, the police lieutenant who was shown in the videos pepper-spraying the protesters, told The Sacramento Bee he was relieved by the DA’s decision. Pike was fired on July 31 by the campus police chief who took over the university’s police department after the chief who was in charge last fall, Annette Spicuzza, stepped down under fire. NBC News' James Eng and The Associated Press contributed to this story.